Proper onboarding will benefit your practice and your patients by reducing employee turnover and hiring expenses, and by improving the quality of your team. Developing an onboarding plan will take time, effort, and a bit of creativity. If you’re unsure of where to start, or if you're nervous about putting it all together, don’t be! We’re here to help and have put together a step-by-step guide to creating a personalized onboarding plan for your practice. Before anyone starts something great, they cast vision. It is vital that you determine the end goal for your onboarding plan. You'll also need a timeline for development and implementation. Your onboarding plan should answer the question “What does an ideal employee look like?” This is two-fold; you should have a vision statement for your overall onboarding plan, and then a vision for each specific position. The overarching vision statement for your onboarding plan will be the same for every new hire. This consistent use of your vision statement will maintain a steady stream high quality employees across departments even as your business grows. Here's an example of the application of your vision statement. General application: Once a new hire (we'll use an ophthalmic technician for our example) completes the onboarding plan, they’ll be ultra passionate about your company’s values. Position-specific application: The new ophthalmic will also be hyper vigilant about proper charting and intake (specific vision). Decide from the start what you’re trying to achieve by creating an onboarding plan. After you’ve decided on your overarching vision for the onboarding plan, bring in a few (keyword: few) of your senior/high level team members and pass on that vision. Get them excited about how the team is growing and how you need a sure-fire way to duplicate them as skilled employees. Now that they’re fired up, and a little flattered, task them with collaborating to list every skill a new hire needs to master and every concept they should understand to thrive in your practice. This is the brain vomit part. Your staff will give you a mountain of information, so don’t do it all in one sitting. Give them the vision statement, collaborate a bit at the initial meeting, then have them use a platform (like a shared Google doc, or a Trello board) for them to constantly add information as it arises. Never set a deadline for them, they can continue to add even as you move on to the next step. You will end up with a long unorganized list. Step 2: Organize, Then Organize Again. What should everyone on staff know? These could be things like the employee handbook, PTO, parking, dress code, chain of command. You could also integrate an element of cross training here. Using our eyecare example, a front desk associate should be able to handle minor glasses adjustments or nose pad replacements, and a scribe should be able to answer the phone and answer basic insurance questions. What should each department member know? This is where you really divide the list quickly. For example, your front desk associate should be skilled in phone etiquette and cash handling, and your technician should be able to check visual acuities. What are the major skills, and what are their components? Without a doubt, your collaborators will include minor things on your list that are actually stepping stones to a more major skill. So, if the broader goal is to teach someone how to check visual acuities than the component would be teaching them the 20/20 scale and the Snellen chart. Organize your list from basic skills/concepts to advanced skills/concepts. This will help you greatly in step 4. This typically takes several sittings, several cups of coffee, and the sacrifice of a pinch of your sanity. I would advise to only bring in one, or maybe two, other people into this phase of the project. Keep the big picture in mind and don’t sweat the details. So now that you’ve decided on what they need to learn, you need to determine how they’re going to learn it. Decide what and who the credible resources are. One of the best ways to do this is to develop an LMS (learning management system), where you can create classes that the new hire will take. If you’re not to the point where an LMS makes sense, that’s perfectly okay. Simply decide on the books, manuals, and one-on-one training time you think will be necessary to teach a new hire the skills and concepts they need. If you’re at a loss for resources, don’t fret! Youtube has a plethora of how-to training videos for opticians, technicians, and customer service. You can still onboard even if you don’t have the the ability to create your own training materials; just vet the available resources online and choose the most appropriate ones that suit your needs. The resources the new hire will need to learn what you want them to know. From here we’ll use a calendar and a skills tracker. Develop a calendar that will act as a road map to your new hire’s first 90 days. In the calendar, you’ll list daily “to-dos”, from which they will glean the conceptual knowledge you’ve identified and will acquire the skills you’ve listed in the skills tracker. You can decide how detailed you want your calendar to be. I like every new hire to have a very structured first month; I plan their entire day and know what they will be learning each day. The first week should be considered orientation; tour the office, introduce them to your staff, and have your new hire shadow in every department. You want them to see the interconnectedness of the entire office. I implement a lot of customer service, company values, and basic training (like basic ocular anatomy) in the first week. Since they’re just getting their feet wet, I find setting daily goals with lots of one on one training to be helpful. After the first week I up the ante; every day, they will have skills they need to master and will perform them for real patients under the supervision of their trainer. Once they’ve been with the practice about a month, I encourage them to become a true contributing member of the team and their calendar is less filled as they transition out of training. With some supervision and guidance I expect that they should be able to help in some form, even if it’s confirmation calls or cleaning glasses before they’re dispensed. Here's an excerpt from an onboarding calendar for week 3 of a new technician. The skills tracker is a signed agreement between you and your new new hire. It is a list of skills you expect the new hire to acquire and the time frame in which you expect the new hire to master them. I think the easiest way to do this is to divide it by week; in week one you expect these listed skills to be mastered. It is very overwhelming to both your trainer and new hire to be handed a list of 150 skills to be mastered in 90 days. Dividing the skills by difficulty and importance will give your new hire and your trainer the focus and motivation to achieve the goals each week. It is important that these statements are written in 1st person - it helps the new hire identify with the skills and keeps them honest. 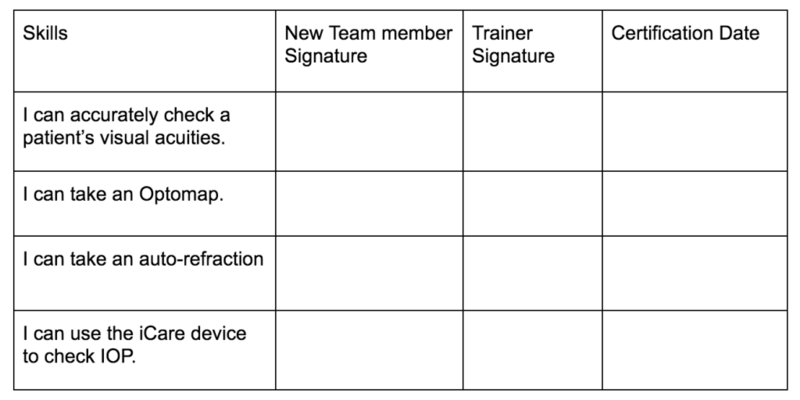 On the skills tracker, there are two spaces for signatures: one for the new hire, and one for the trainer. When the new hire feels that he or she has mastered a skill, he/she can sign the tracker and bring it to the trainer for verification. This puts the new hire in charge of their own learning. From the very start you’re empowering your employees to be problem solvers and to take initiative. Below is an excerpt of the skills tracker continuing from the example above. You now have a beta version of your onboarding tracker. From here, train the staff member you’ve chosen to be a trainer on the new program. They will, ideally, have been a part of your collaboration group, and will be excited about the new program and its success. Have them check out all of the resources the new hire will have access to and make sure they are familiar with the timeline. Set expectations of how your trainer should engage with the new hire. I think daily check-ins between new hire and trainer holds the new hire accountable and makes the trainer available to answer any questions. I challenge my trainers to have coaching sessions with the new hire related to the customer experience and the values of the company. Both of these benefits directly impact employee engagement. Lastly, I encourage my trainers to act as the new hires “first friend” at work to make the new hire feel at home with the company and part of the team. The next step is beta testing. You won’t know if your system works until you try it. Expect kinks, and expect glaring holes. Sometimes you miss things! You might have missed a giant gap of educational training, or even basic onboarding tasks like signing tax papers. This is why we test it. Let your new hire know upfront that you’re implementing a new onboarding procedure, that you think it will help them be more successful, and ask for grace as you work out the bugs. During the beta test, check in with your trainer every week. Make sure they’re hitting all their marks- daily check-ins, skill checks, coaching sessions. Ask your trainer(s) for feedback on your onboarding process. Is there too much time allotted for certain activities? I’ve found that your new trainer might feel under significant pressure. It is important that you guide her through the process so she feels comfortable. Ask your new hire(s) for feedback about onboarding as well. Is there anything confusing about the process? Have you worked at another office that maybe did this better than we do? The key is to find points to improve. Don’t throw the baby out with the bath water. Take the feedback you’ve received and go back to step 4. Edit your calendar and your skills tracker, train your trainer, and test again. It will likely take a couple new hires to get it just right, and even when it’s “complete” always be looking for ways to improve it or update it as your practice changes and grows. Implementing a comprehensive onboarding plan will increase employee and customer engagement with your practice and ensure consistent successful transitions from fantastic applicant to fantastic employee.